World Real Quick Info: Ways to protect yourself from ATM Frauds. If we think for a while about ATM, first thought comes is that ATM has become everyone's a part of daily routine around the World. The convenience and ease in transacting through ATM has really saved time and efforts. The availability of ATM machines in almost every corner of the City attracts the Fraudsters for easy access to steel our hard-earned money. There are ways to protect ourselves from these Fraud attempts and stay safe. This article is part of Stay Alert Series and a good read for everyone who will provide some additional knowledge on how we can secure ATM transactions and avoid ATM frauds. Almost every day there's news on ATM frauds. The Victims hard-earned money was stolen within seconds. This should not happen and can be evaded. We cannot read Fraudsters mind but can increase our knowledge and awareness to different types of ATM frauds and the Fraudsters will be having hard time to take away our hard-earned money. Below are different types of ATM frauds and some preventive Tips. Let’s have a look one by one. Now a day Card Skimming has become number one threat globally. Essentially, skimming refers to the stealing of the electronic card data, enabling the criminal to counterfeit the card. Consumers experience a normal ATM transaction and are usually unable to notice a problem until their account is defrauded. The proliferation of fraud and crimes committed in the ATMs has reached new heights and Fraudsters have become more sophisticated. The most common is the so-called cash trapping perpetrated by the notorious group called Ruler Gang. They were given that name because of the device they use in trapping the cash that looks like a ruler. In the U.S., the device is called the False ATM Presenter. A member of the gang will install a specially fabricated “ ruler ” device onto the cash out shutter of the ATM and leaves it there. This device looks exactly like the cash out shutter of the machine. When an unsuspecting cardholder tries to withdraw, the cash will be trapped inside (it is actually glued at the back of the device). After a while, the cardholder, thinking there is something wrong with the machine or with his/her transaction, will leave frustrated and disappointed. Thereafter, the gang will remove the device with the cash still glued on it using their special prying tool. “ May I Help You? 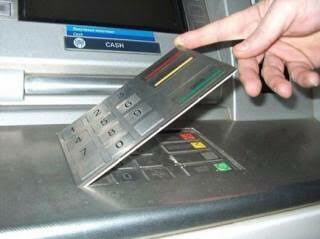 ” is another ATM fraud employed by notorious elements preying on the elderly and those new in having an ATM card. Once these perpetrators spotted one, they will appear to be very helpful and offer assistance to the unsuspecting cardholder but in truth, these perpetrators are already memorizing the card number and PIN. With the card number and PIN, the gang can easily transfer the funds to their own bank account using the internet or mobile phone or a clone ATM card. There are other fraud and crimes committed in the ATM because of the fact that it is where the money is. When the cardholder is about to retrieve his/her ATM card right after withdrawal, one of the gang members will cut-off, get the card coming out of the card slot, and replace it with a similar looking card. All of these will happen in just a split second. The unsuspecting cardholder, without realising what had just happened, will get his/her 'card' and immediately leave. The gang member, who had already seen the PIN during withdrawal, will then use the stolen card in other ATMs and try to withdraw the remaining balance before the card is reported as ‘ stolen ‘. This category is related to any attempt to rob the ATM of the cash in the safe. Methods of physical attacks include solid and gas explosives, as well as removing the ATM from the site and then using other methods to gain access to the safe. These Fraudsters can be very Violent in nature. Logical attacks are becoming a major and growing attack vector, and one that has the potential to cause large amounts of losses. In this type of attack, external electronic devices, or malicious software in used in the crime. The tools are used to allow the criminal to take physical control of the ATM dispenser to withdraw money, which is often called “cash-out” or “jack potting,” as the machine starts spitting out bills like a casino gaming machine. The other version of malware attack on ATMs sees criminals using software to intercept the card and PIN data as customers use the machine. They can then use this to clone cards and commit fraud at point of sale terminals, ATMs and in ‘card-not-present’ scenarios. Criminals are always looking for ways to get their hands on card data or actual cash, however modern ATMs are designed to prevent attacks occurring, and the ATM industry constantly updates and evolves technology to thwart fraudsters at every possible step. 1. If you find any suspicious objects or persons near ATM or inside the ATM outlet / booth, inform the Bank / Financial Institution. 2. Difficulty in retrieving cash dispensed from the ATM, don't leave the ATM Machine and recheck the error. 3. Do not entertain offers of assistance from strangers when you are performing transactions. Cover the PIN pad with your hand and make sure that no one is looking over your shoulder. If you come across any of the ATM fraud mentioned above, report it immediately to your Bank/Financial Institution to take necessary action. You can also ask assistance from the nearest Police Station to help you, since these Fraudsters are scattered everywhere waiting for their next victim. I hope the information and Tips shared above provided ideas to be more aware when transacting through ATM anywhere in World. There could be additional to the list, if you know other ‘ modus ‘ of these Fraudsters, kindly share it in the comment section below to warn Fellow Millions and Billions of ATM Users around the World. Very useful and well articulated.